about this book: What if you could simply choose to be happy? The good news is, you can! Start your journey toward greater happiness with psychologist and happiness expert Ingrid Kelada. 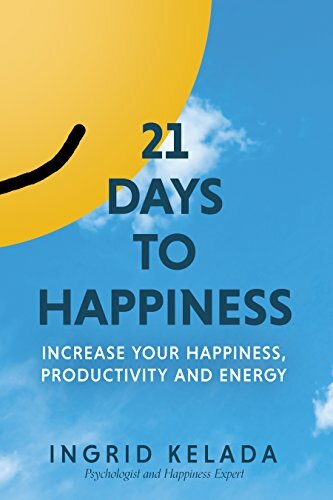 In this book she shares practical, easy steps you can put into practice in just minutes a day which will make a huge difference in your happiness. Each chapter is packed with tips and resources to help you find what works best for you as well as the author's personal experience and research into what creates real, lasting happiness. Complete the 21-day journey and you'll find you feel not just happier but more motivated, energetic, patient and focused. Learn how to more effectively manage your time, what makes relationships most satisfying, even how to look at your finances in a way that promotes greater happiness. While feeling busy or stressed may seem like it's become the new normal, it doesn't have to be. Whether you're looking for a boost or seeking a new way to live, this book can help you make lasting, positive changes. Happiness is a choice. Let 21 Days to Happiness be your road map to a happier, more satisfying life.